With the onslaught of anti-animal owning and breeding legislation being forced on U.S. citizens by extremist animal rights groups such as the HSUS or Peta, I decided to start making an effort to educate the average animal-loving person. There is a lot of confusion as to terminology, much less ideology, in this area. Animal welfare has to do with the care of animals, making sure their needs are met in all ways, but not elevating them to an equal status with humans, or above humans. I am all for this, and go to great lengths to care for my animals very well, and take every opportunity to educate others to do the same. You can think of WELFARE as QUALITY OF LIFE for animals. Animal rights has to do with making animals equal to humans in terms of the law and their rights. It often has little to do with actual welfare. I am very opposed to this movement for a number of reasons, the biggest of which is that many in this movement want to see a total elimination of any ownership, usage or even contact with all animals. They use the big organizations such as HSUS or PETA to lobby lawmakers to enact laws to this effect, which is forcing the extreme beliefs of a few on the majority who would be opposed to it, if only they knew it was happening. Some animal rights groups resort to terrorist tactics, threatening human life to push their beliefs on everyone. It should also be noted that the HSUS (Humane Society of the United States) DOES NOT operate any shelters, and only about .5% of money they take in goes to actually help shelter animals. They seem to rely on ambiguity and deceit to raise funds, often taking advantage of natural disasters or high profile abuse cases to raise money, while using little or none of that money to actually help the animals in need. This can all be documented on some of the sites I have listed below, especially the Center for Consumer Freedom and others. There is a huge push by animal rights activists to change the legal status of pet owners from OWNERS to GUARDIANS. I and many others are very against this movement. As much as we love our animals and consider them members of the family, they must retain their legal status as property. In doing so, they are protected from "authorities" who seek to remove animals from loving homes, in a misguided effort to "rescue" them. I know and understand that there are cases of abuse and neglect and these must be dealt with correctly and promptly. There are already laws in place for these cases. But, if many activists have their way, NONE of us would be allowed to share our lives with a single living animal. Some have a philosophy of "better dead than owned" and will stoop very low to see this happen. So, if it ever comes to a head, please vote to retain our animals' status as property, even if they aren't property in your heart. Their very existence counts on it! I have added many links to various sites that will give you more information and insight on this topic. It is my hope you will take the time to educate yourself and make more informed decisions. I know many animal lovers donate to various causes without actually finding out the ultimate agenda of their chosen charity. For the most part, big ones like the HSUS don't even have shelters or help animals directly, and only a small percent of the money they take in goes to help actual animals. 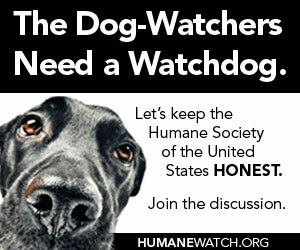 The HSUS is really just a lobbying group, not an animal welfare group with shelters for animals. If you really want your dollars to go directly to helping animals, giving to a local shelter may be the way to go. It is good to even check them out and make sure they do a good job with the animals in their care, since not all do. This is a great blog site with thought provoking articles, a MUST READ! This has up to date, well written blog entries and is one of the best in existence!! A new fun site - Human Watch! This is going to be another must read site. One of the best out there!!! The Sportsmen's and Animal Owners' Voting Alliance (SAOVA) is a nationwide, nonpartisan group of volunteers seeking to elect politicians who will oppose the "Animal Rightist" (AR) threat to our rights as Americans. It is the only national group working to protect both sportsmen and animal owners, natural allies, in the legislative and political arenas. SAOVA's members hunt, fish and own livestock, dogs, cats and other pets. We study political candidates in all states to identify those who understand and resist the AR threat, as well as those who are in the pocket of the Animal Rightists. Disturbing quotes from animal rights activists, must read! In closing, something I want to see happen is for all pet animal lovers, ranchers and farmers, hunters and fisherman, horse owners and so forth unite to this cause. The animal rights wacktivists have long counted on us being divided and nitpicking each other, or simply ignoring the issue, while they are free to forward their cause. We can't afford to give them that freedom any longer, and must all become active in defending our rights to have animals in our homes and lives, on our farms and in our woods and rivers. Here are a few links to some nice posters designed by AKC. Please print a few out to post in local stores (pet stores, feed stores, vet offices or anywhere else that dog owners may see them.) Hand them out to your dog owning friends. This last one is the AKC legislative page link. Here is another nice article detailing how the H$U$ spends in money. Hint, it's not on actually helping ANIMALS! You might have to cut and paste this link, as I haven't been able to get it to insert as a link. It's a short article and worth reading! Here is a little humor, but it also has a lot of truth! 10. Shelter dogs can have problems; they arentt for everyone. 7. We're firing all the lobbyists and lawyers, and we're going to put the money into training animal control workers, improving shelters and organizing transport programs. 6. We're good at raising money but we don't know much about animals. If you want advice about animal policy, you should talk to an experienced breeder, rescuer or farmer of that species. 1. We're proposing a law to make it easier and more fun for people to own pets.